Early morning sunshine, the snow is almost gone and spring is finally here! It's time to start thinking about spring clothes, yay!! I like to be comfortable, which is why I LOVE this outfit! It's so easy to wear--I could live in it! 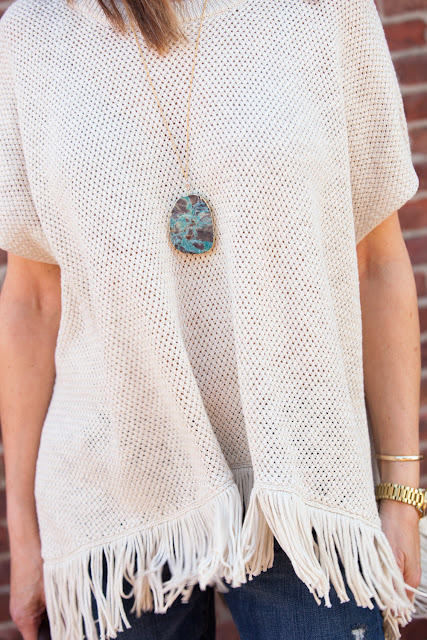 This Michael Stars fringe poncho can be worn by itself or layered over a blouse or tee. I paired it with DL Riley jeans. Boyfriend jeans are a relaxed cut that look great rolled up. Both pieces are from Lyn Evans. And these Isola boots! Are they to die for or what? There's a story behind them too. I saw them on the Lord and Taylor clearance rack for $44.00 from $350! To sweeten the deal even more, I had a $20 coupon which made them $24.00! Yep I was doing the happy dance all the way home! they're still an amazing deal at 6pm.com. 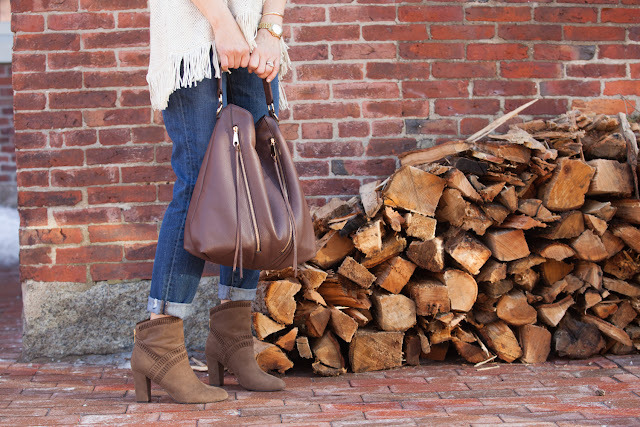 Keeping things on the relaxed side with this Rebecca Minkoff slouchy leather bag. Less expensive options HERE and HERE. And as for accessories, I kept the "boho" theme going with this gorgeous chunky pendant from Luxa Jewelry. I am so hooked on Luxa...the line is unique, beautifully made and very affordable! And the last accessory to model is a strong cup of coffee. Caffeine makes the world go round. Affiliate links in this post may generate a small commission or be gifted. However, the content of my posts are based on my own honest opinions and are not in any way influenced by partnerships. Love the outfit. Boots are so cute and the colors all look great together. Thank you so much for the sweet comment!!! So glad you showed the boots with the cuffed jeans. Never was sure what shoes besides flats to wear with this type of jeans. Poncho terrific! Thank you Nina!!! Wedges or even heels also look fabulous with rolled up boyfriend jeans! 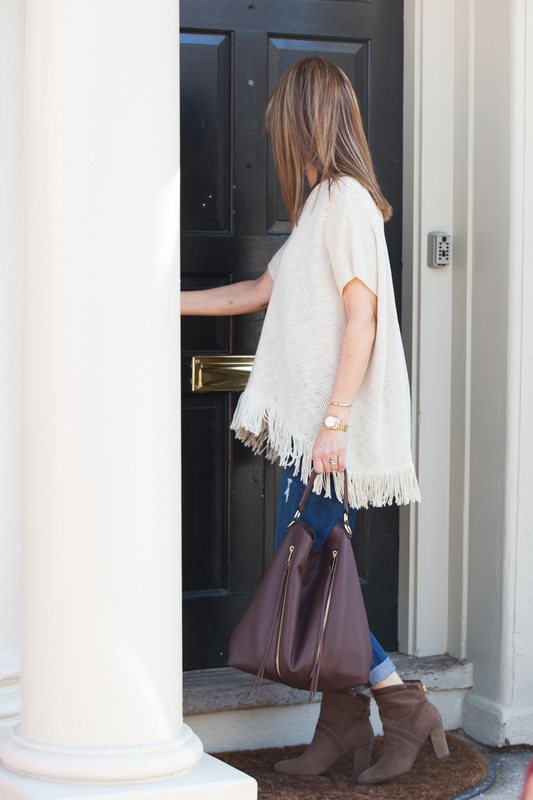 Love the fringed poncho! I'm so into the warmth of those especially for going out on chilly LA nights! Hi Rosie! Thanks so much for your comment. Ponchos are great--so versatile and comfy!! Looking forward to checking out your site! What an amazing look! I love that poncho and your boots! Hi, I am Ada. So glad I found your blog, today. I just bought a similar poncho at Loft and you are giving me inspiration to style it for early Spring. You look fantastic! 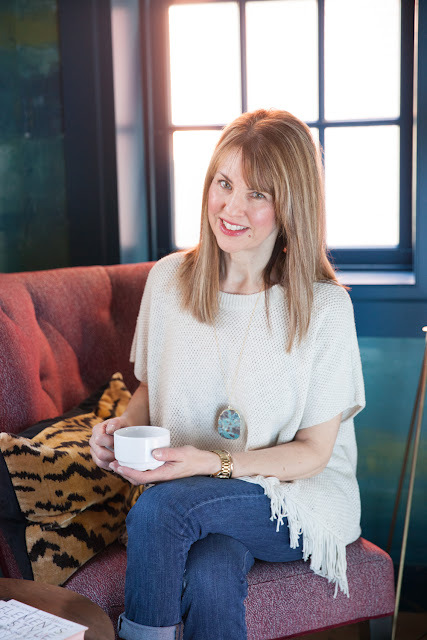 I have started a linkup on Thursdays I would love for you to join, please. The current one is live (link below). Thanks so much and Happy Monday!